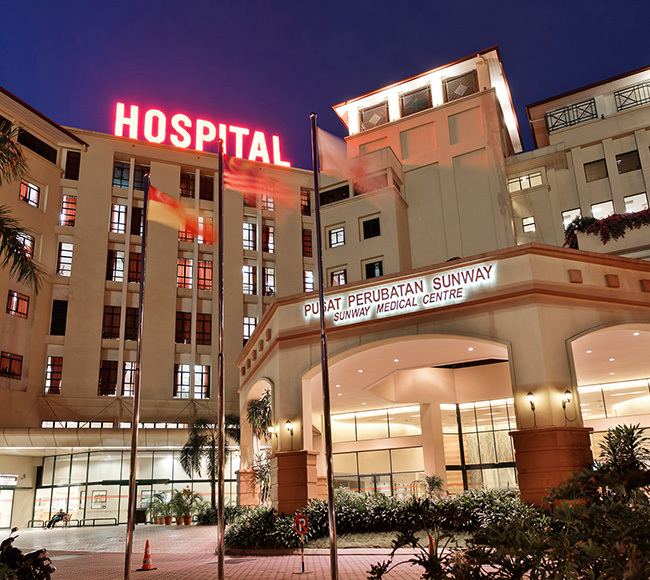 Established in November 1999, Sunway Medical Centre (SMC) is a private hospital accredited by the Australian Council on Healthcare Standards (ACHS) and Malaysian Society fro Quality in Health (MSQH). It is strategically located within Sunway City. As one of the leading private leading tertiary medical care centres in the country, Sunway Medical Cetre is poised to set new standards of service for its growing clientele with a total of 369 licensed beds, 130 consultation suites and 12 operating theaters. SMC offers a comprehensive range of medical services, which includes facilities and advanced medical technologies for outpatient and inpatient speciality care, health and wellness programmes and 24-hour emergency services. These are coupled with a strong support system comprising more than 2,000 dedicatd healthcare professional including medical consultants, professional allied health staff as well as trained and dedicated nursing staff. SMC is affiliated with the Jeffrey Cheah School of Medical & Health Sciences, Monash Univeristy Malaysia, University of Cambridge, Royal Papworth Hospital and Harvard Medical School to further meet the demands of medical education, training and research. SMC is well connected as it enjoys easy access to Kuala Lumpur and the Klang Valley via 5 major highways namely New Pantai Expressway, North-Klang Valley Expressway, KESAS Expressway, Damansara-Puchong Highway and Federal Highway.